Home benefit and harm of eggs body brain brain cells chicken eggs eggs health benefits sharp eyesight strong Vitamin D What'll Happen to You If You Start Eating 3 Eggs a Day? What will happen if you eat three eggs a day? Others say they may trigger a heart attack and people who want to lose, weight usually removes eggs from their diet. But what if you tried to eat three eggs a day? We bet you're cringing right now. But don't be so hard on those poor eggs. You might be missing more benefits than you realize. We will crack the miss behind eggs. Especially the egg yolks. Plus by the end of this article, we'll let you know what will happen if you eat three eggs a day. chicken. For this to happen an egg must be packed with life-giving nutrients. Save that amazing fact for later use and subscribe to our blog now. So that you'll always be the first to see our new article. First, we'll tell you how an egg is loaded with amazing stuff. It contains calories, protein, healthy fats, folate, calcium, zinc, phosphorus, selenium and vitamins A, B, 5B, 12B, 2D, E, K, and B6. What are we talking about again, is this about multivitamins? "Nope" these vitamins and nutrients can be found in an egg and it's cheaper than all those pricey supplements. You're not yet sold. Are you? Alright, you've heard that eggs particularly the yolks contain an insane amount of cholesterol. But did you know that cholesterol is not entirely bad? According to the website medical news today. It can be found in every cell in your body. This waxy and fat-like substance plays an important role in digestion and vitamin D production. It also helps generate steroid hormones like testosterone, estrogen, and cortisol. Note that it has two types: Low-density lipoproteins or LDL also known as bad cholesterol and high-density lipoproteins or HDL the good cholesterol. The American Heart Association explains the difference between the two. LDL contributes to fatty buildups and arteries or the process is known as arteriosclerosis. And increases the risk for heart attack stroke and peripheral artery disease. On the other hand, HDL knocks out LDL by taking it away from the arteries and dumping it on the liver to break it down and annihilate it completely. The American Heart Association didn't define HDL in that streetfighter style but you get the gist. So, the more HDL and the less SDL you have the better. But what type of cholesterol will you find in an egg? Is it HDL? "Nope" Oh No then it's LDL? "Nope"
First Omega-3 fatty acids are healthy fats. Yes, the National Heart Foundatio of Australia said that omega-3 fatty acids can lower your heart rate and rhythm decrease the risk of clotting, reduce blood pressure levels, improve blood vessel function and delay the build-up of plaque in coronary arteries. In the case of dietary cholesterol, several studies proved that eggs don't increase the risk of heart disease according to health line. Hmm, it seems that both eggs and cholesterol are victims of bad press but they're actually good guys. #1 Eggs keep you full and help with weight loss. These two are connected. One of the characteristics of filling foods or foods that satiate hunger is that they're rich in protein. A large egg contains about 6 grams of quality protein. Which may help you eat less for several hours after a meal. As a result, this helps you lose weight. Because you're satiated and can avoid impromptu trips to the fridge when you're feeling hungry. No offense to bagel lovers, but a study showed that an egg breakfast enhances weight loss more than a bagel breakfast. #2 Eggs improve eye health. After this, you'll see egg yolks in a new and positive light. Why? Egg yolks contain lutein which helps reduce the risk of age-related macular degeneration and cataracts. It contains ZX Anthon which protects you from the sun's harmful UV rays. Moreover, according to the egg nutrition council "Yes"
The council has spoken. Eggs can protect your eyes from retinal damage. Because they contain omega-3 fatty acids. Did we miss any other important details? Oh yes, eggs are loaded with vitamin A which protects your cornea and zinc which improves the health of urina and helps you see better at night. 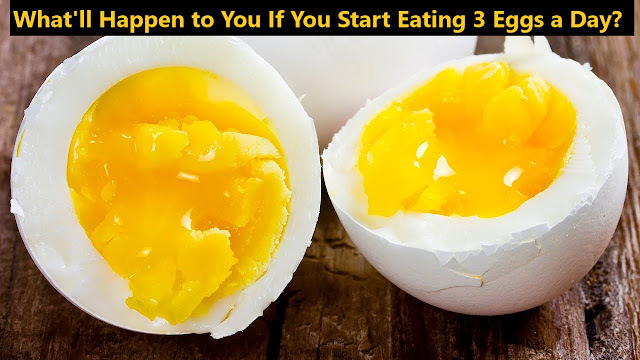 #3 Eggs keep your bones healthy. yolks. Wow, those yolks are in a roll. Improve bone metabolism and prevent the risk of osteoporosis. and calcium to improve the density of your bones. #4 Eggs prevent iron deficiency. What is iron deficiency? And what does it do to your body? This occurs when you don't have enough iron in your body and low iron levels can lead to equally low red blood cells. Iron is needed to produce hemoglobin. The part of red blood cells that carries oxygen throughout the body. How can you maintain the right amount of iron? Eat eggs. "Yes" They are a source of iron. #5 Eggs help with brain. Development in infant and fetuses. Eggs aren't only good for adults but for infants and even fetuses. The choline and eggs are beneficial for fetal brain development. The yolks can also help to prevent birth defects during pregnancy. Vitamin B is important for the development of the spinal cord and fetal nervous system. It also helps prevent breast cancer, according to a study. So, eggs are essentially food for the brain. Wow, eggs were really underestimated and wrongly viewed by many people. Come to think of its eggs are not the culprit. We should be looking more closely at the food we partner eggs with. That's swimming in saturated and trans fats. For example Eggs with ham, bacon or hot dogs, this is what The National Heart Foundation of Australia observe and they recommend matching your eggs with a healthy option. But keep in mind that not all eggs are the same. How can you choose the right egg? This is a tricky one. Health line says there are four types of eggs and they are organized based on where the hand is raised and fed. Conventional eggs The hens are fed grain and their eggs can be found in supermarkets. Organic eggs The chickens are fed organically and not treated with hormones. Pastured eggs The hens are free to roam and eat natural foods like plants and insects. Omega-3 enriched eggs The chickens feed is mixed with flax seeds a source of omega-3. because we'll help you rank the eggs. Starting from the least healthy. If you can't find the last three and it's fine to go to your nearest supermarket to buy eggs. Should you be conscious about how you cook your eggs. Since there is a standard regarding the right type of eggs. The United States Department of Agriculture or USDA says that "It's okay to poach bake scramble hard boil and fry eggs" Also, make sure the yolks are firm while cooking. between them? Well, are you familiar with this pattern! Brown rice, brown sugar. So brown eggs are best! But did you know that there are blue or blue-green eggs? Whoa.. going back to our question of brown eggs or white eggs. The truth is that it doesn't matter. Brown and white eggs have the same nutritional value according to the USDA. Who debunked all previous myths on this matter. Let's now tackle our big question. What will happen if you eat three eggs a day? It's now clear that eggs are good for your health but how many can you eat in one day? What is the standard or an ideal number of eggs? A study from the department of nutritional sciences at the University of Connecticut. Revealed that a person who consumes 3 eggs a day, may experience more of an increase in good cholesterol and a decrease in bad cholesterol. Than, someone who eats the same amount of egg substitute. That is so great. The UK National Health Service says there is no recommended limit. Meaning eat all you can. On the other hand, the American Journal of Clinical Nutrition suggests a maximum of 12 eggs per week. The National Heart Foundation of Australia limits it to 6 or 7 eggs each week. Regardless of the number, the message is clear. It is safe and healthy to eat eggs. According to several health authorities and institutions. Eggs have been unjustly demonized for many years. Whether by commercialization or poor research. We hope that this article has helped you unscramble some myths regarding eggs and that you'll give them their rightful place on your plate. If you want to make good in Neurology Residency Interview you have to have a good idea about Neurology Residency Interview Questions. Here https://radiology.residencypersonalstatements.net/hematology-oncology-personal-statement-writing-help/ you can know everything about Neurology Residency Interview. Do you know the top rheumatology fellowship programs 2018-2019? visit site to know it and Getting Started with Rheumatology Fellowships Program Application. Start your journey with the help of expert for your success. If you want to ensure your application for surgical residency you must do your statement different from others. Our expert is ready check more info. I think you will find your dream writing here.